Samsung makes a ton of products, from computer parts to home electronics, and is a household name. So, it is not surprising that Samsung is here with an M.2 SSD drive that is a beast when it comes to speed and electric performance. There are a lot of brands that people recommend I use for different computer parts and networking devices, but a constant is that all my friends usually recommend Samsung SSDs. I have reviewed a Samsung portable 1TB SSD drive previously, which I loved, so I was excited to review the Samsung Pro 950 256GB. 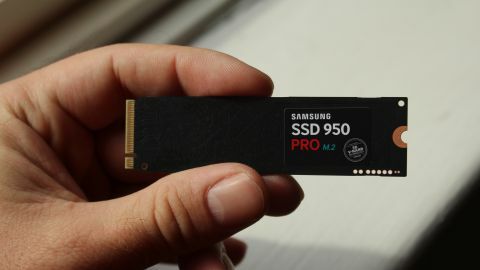 Building the Samsung Pro 950 on NVMe (Non-Volatile Media Express) technology, which is an interface designed specifically for SSDs, allows the Pro 950 to be super fast. A good introduction on NVMe technology can be found in our article on the Intel SSD 750 Series 1.2TB review, which is also what I will be comparing the Pro 950 to. The Samsung Pro 950 comes in two models, 256GB and 512GB. The Pro 950 256GB costs (US$199, £130.05, AUD$276.45) whereas the 512GB model costs (US$399, £260.76, AUD$554.16). For the 256GB model, the price point is not awful for new technology and for the speed boosts you are going to get. Put it this way, the performance of a normal SSD is going to be limited to SATA, and which generation Sata you have on your motherboard. But, the fact that the M.2 aspect of the Pro 950 interfaces with your motherboard directly, if applicable, or via a PCIe adapter where PCIe 3.0 x4 is going to be able to offer a higher read/write performance. Now, the Intel SSD 750 1.2 TB drive, which does offer more space, costs a lot more at $1,029 (£693, AU$1,360). The Samsung Pro is going to be compatible with most operating systems. However, there are some software constraints with encryption on Windows 10, but nothing that is prohibitive to encrypting your data. The Samsung Pro 950 measures 3.16" x 0.09" x 0.87" (WxDxH, 80.26mm x 2.29mm x 22.1mm) and weighs an incredibly light 0.02 lbs (9.07g). The Pro 950 uses an m.2 connector and supports PCIe 3.0 x4 (up to 32Gb/s) NVMe 1.1. If you don't have PCIe 3.0 then the speeds may not be equivalent to the tests in this review. What is pretty cool is that the Samsung Pro 950 supports TRIM and Auto Garbage Collection (GC), which are both pretty crucial. TRIM and GC are instrumental in how an SSD is able to write over old blocks of data and in terms of how the drive performs. Additionally, the Pro 950 supports AES 256-bit for User Data Encryption TCG Opal. The Samsung Pro 950 uses about an average of 5.1watts, 70mW on idle, which is pretty awesome. While this is all dependent on your computer's configuration, this could, theoretically, increase the battery performance of your laptop.